I did it! I bought my first pair of white denim! And now that I shot them for this post, I can wear them in real life! Truth- white pants terrify me! The main reason I refused to wear them before taking these photos was pure fear that I would spill on them. It is also a major reason why I have never bought a pair. And honestly, I am a still scared to wear them. What if I sit in something? Or spill my wine/food on them? Or get splashed by the mud caused by our recent rain storms? Yep, I am totally an over-worrier! I decided a few months ago to take the plunge and find a pair of white denim to try out. I love outfits with white denim! They really go with every color of the rainbow. I had already planned like a dozen outfits before I even found a pair. It took me a while to find a pair because I wanted them to be a thicker material, have some stretch, and be under $100. I found this pair from DSTLD which is an online only store. Because they do not sell in stores, their prices are minus the department store price mark-up. It is a huge perk to buying from these kind of brands. I liked that they offered free shipping and free return shipping. They even sent me a separate bag to return them in (which I ended up needing to return my first pair). Just a heads up, I preferred the fit of one size up. My normal size fit just fine, but I wanted a white jean with a little more room than my normal skinny jeans. I feel like white has a little less forgiveness, and I wouldn’t mind if they looked a little bit loose. As soon as I found the right fit, I began the mission of finding the right top! 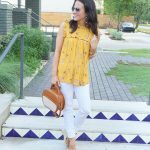 How pretty is this Anthropologie top?? I really like the all neutral look, and this top fit the bill perfectly! Plus, it covers my seat area, just in case I sit in anything. 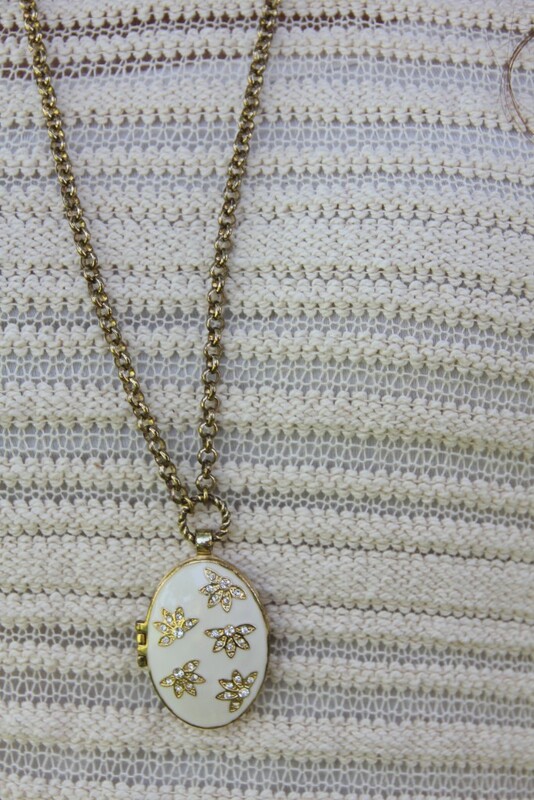 That brings me to my vintage floral locket! I briefly mentioned this locket in my post on Wednesday. I had buyers remorse that I did not purchase it, so I went back and I am soooo happy it was still available. It is so gorgeous! You can probably see why I couldn’t get it out of my head for like a week or so until I could go back and buy it. 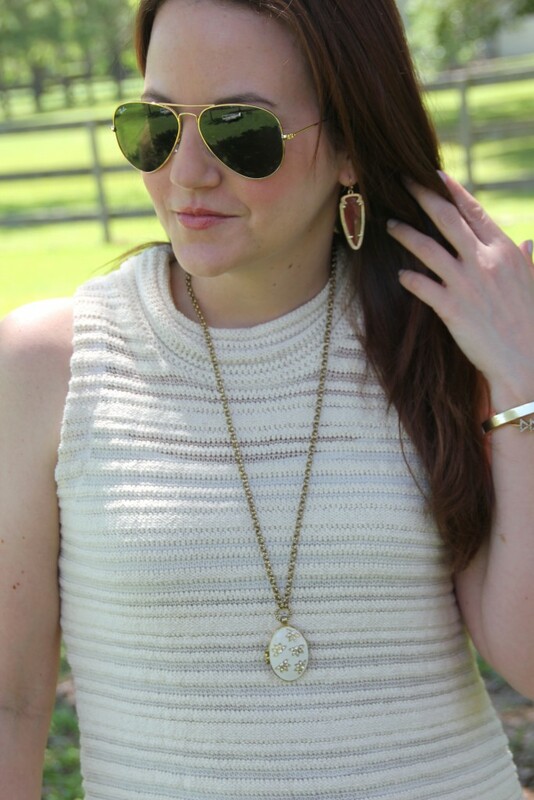 While this outfit would look awesome with a pop of color necklace, I really liked keeping my necklace in the same neutral color pallete. Now to be brave enough to wear these pants out the door!!! Happy Friday Ya’ll!! Love this outfit you look great! I think if I have kids I would be even more scared! I have heard of some that are stain resistant from Joe’s Jeans that I may try if I really like wearing these. I have a pair of white jeans but hardly ever wear them for exactly the same reason. Somehow I manage to wear blue denim almost every day and rarely sit in anything or spill anything, so why do I think I will immediately spill when I wear the white ones? I love how versatile you make them sound, this spring/summer I will definitely try to wear mine more. I know I think the same thing, I so rarely spill on my normal clothes! Thanks for stopping by! I bought my first pair of white denim capris this spring! I haven’t worn pants in years! I love them. I love the neutrals in this outfit. The top is really cool, too. Great high neckline! I have the same white denim fear but I love the look of them. Truth be told how often do we actually sit in anything or spill on our jeans? But it still makes me nervous. I’m always afraid I’m going to spill on my white jeans! 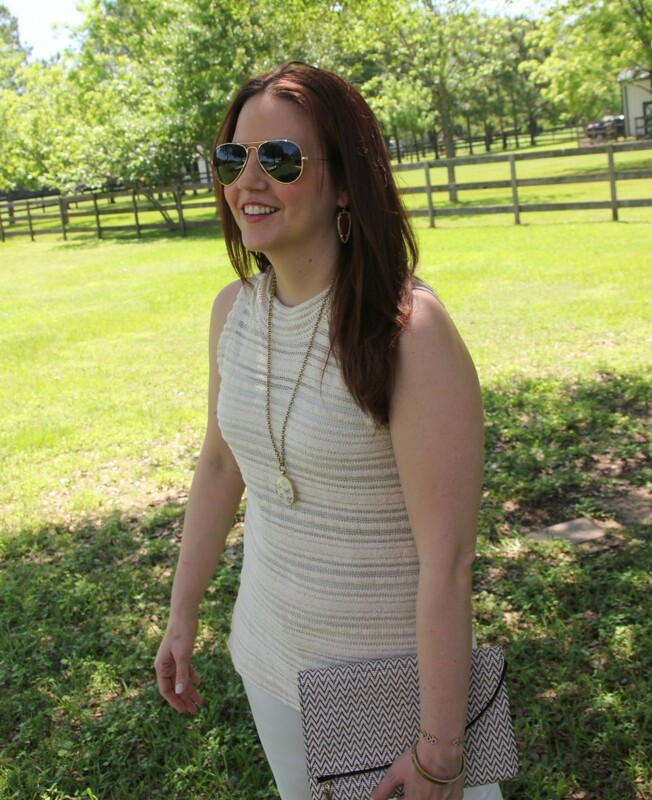 This is such a fabulous look with the white and neutrals! 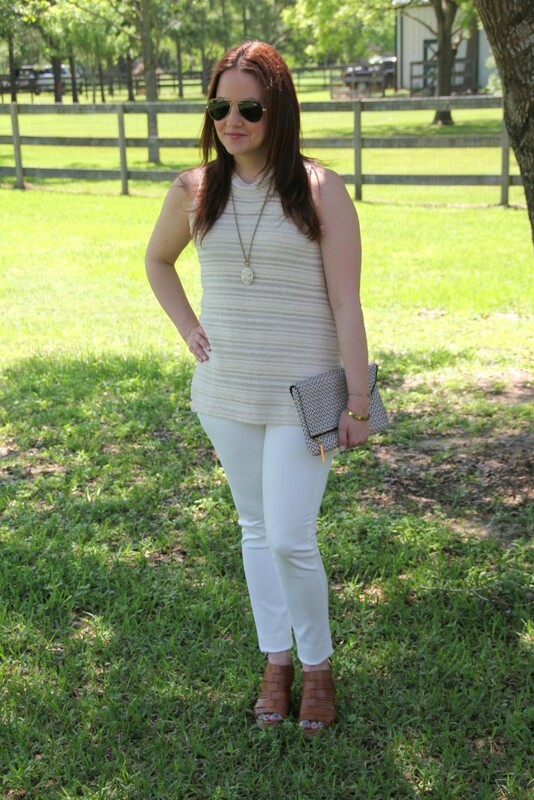 I love this outfit, and that top is perfect with your white denim. Much like you, I’m terrified of white denim, or white anything (How do people have white couches?! I’m jealous, but I could never). I’m a notorious spiller, so I always try to find spill proof white. A little bit more pricey but for piece of mind, I’ll take it haha. I never knew stain resistant jeans were a thing until after I committed to this pair (aka ripped off the tags). If I wear these a lot, I am definitely looking into spending a little more for stain proof! Ha, I ALWAYS spill on myself when I wear white! You look fab in your new jeans! You look amazing I love your shirt with fringe bag.